Food, Family and Footsteps – Run. Ride. Roam. Today was a day of…sunshine! You bee-yoo-teee!! 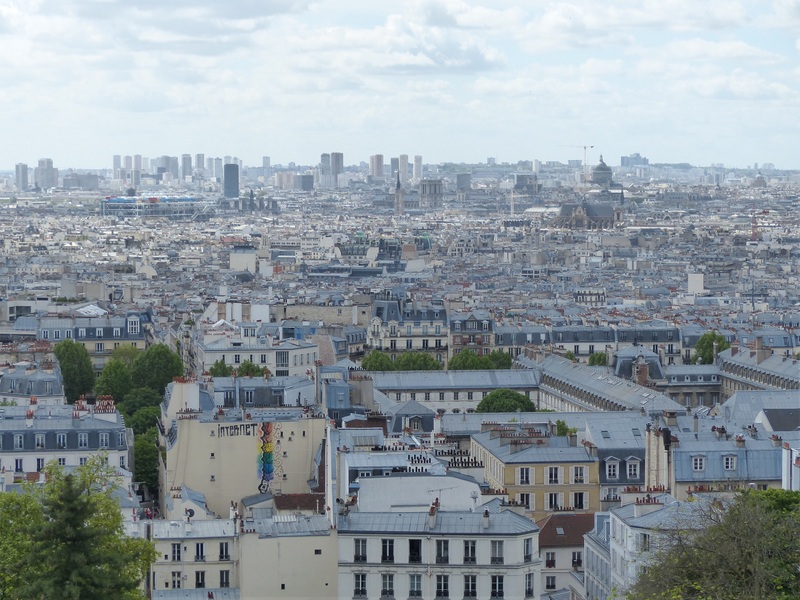 We had a lovely day for roaming, so we set off to explore Montmatre. We took our usual 45 minute bus and train trip into the city, since we’re not actually staying in Paris centre, but in Champigny-sur-Marne, about 20km out of Paris. 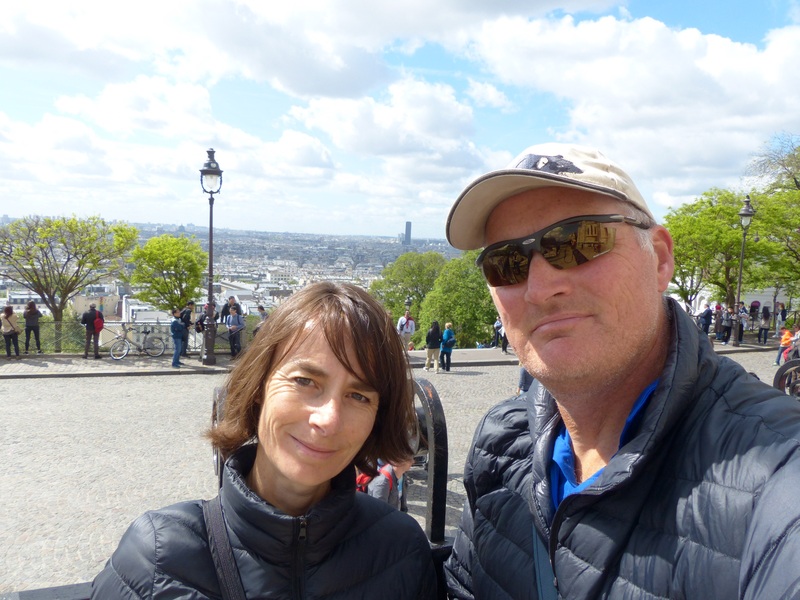 As we left the Metro station in the city, we started on the “Footsteps” part of the day and began our walk toward Montmatre. The areas we walked through along the way must have been a bit swanky because the stores were mostly high-end retail and the people walking by were très chic! One lady had bobbed grey hair, a tailored navy jacket, navy suede hot pants, tights and suede thigh boots. Not tacky hot pants and thigh boots, but very classy looking hot pants and thigh boots! Another man had a black and white, hip length houndstooth jacket, skinny leg trousers that sat above his ankles, winkle picker shoes and tiny little round, wire spectacles. He looked very cool and I would have loved to have been able to take his picture. Needless to say, we did not suit the standard of fashion and level of chic being exhibited by the locals! Our own unique “campers chic” sat alone as a very distinct and one-of-a-kind fashion trend! 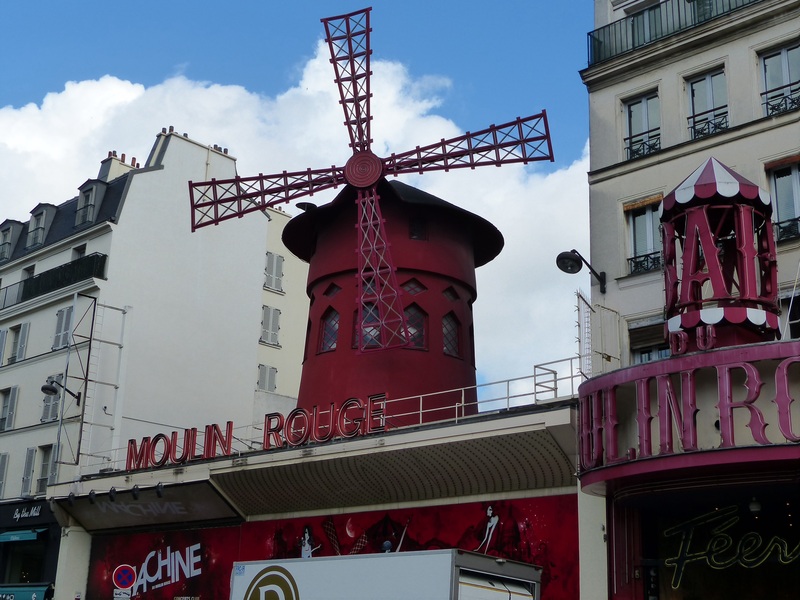 On our way, we also walked past the Moulin Rouge. Montmatre is a hilly area, so we walked up some high streets, with some lovely quiet, cobbled back streets and lane ways. The streets were lined with cafes, greengrocers and small stores and it was just delightful to roam along those “real” streets and get a sense of “real Paris” and not just the tourist traps. 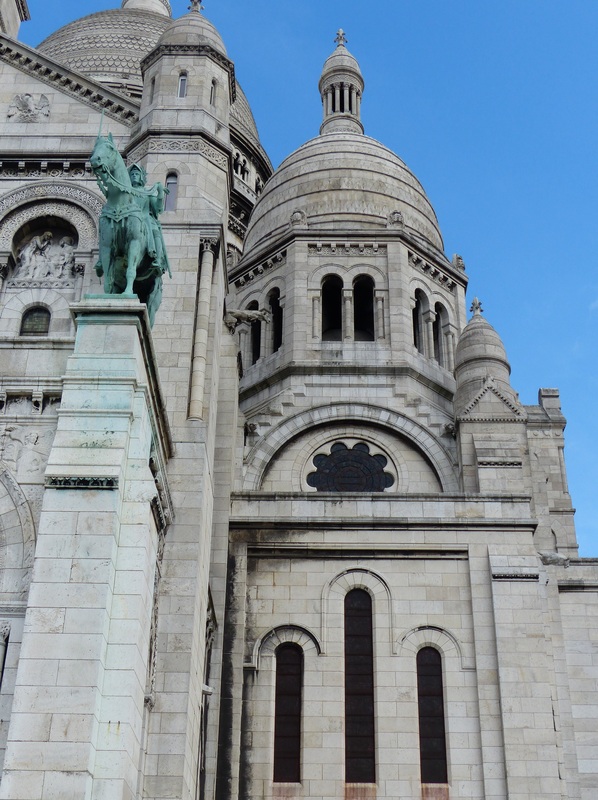 We headed towards the Basilique du Sacre-Coeur, a grand cathedral that sits high up on the hill. To get there, you can either walk up the steep steps in the street, or take the funicular tram. This is where our choices divided! I chose to take the stairs and Steve opted for the funicular. This was partly dictated by the fact that Steve’s gone in the fetlock! After our first day of roaming where we walked for hours and hours, Steve pulled something because he’s had a pain in his calf and leg ever since, so he’s been doing a little bit of hobbling. The funicular spared him the test of getting his sore leg up the steps. So I set off, to give the thighs a bit of a workout up the steps, while Steve waited in line to board the little tram. I beat him to the top, thanks to the lines slowing things down and the less than supersonic top speed of the little vehicle, and sat on the side of the street watching the people coming and going, while I waited for the little tram to chug its way up the hill. The Basilica has a view right across the city, so the grand building itself, along with its location, gave us quite a stunning scene to gaze upon. We went inside and it was another example of an opulent cathedral, with gold and frescos. As we walked through, a Mass began and we sat for a while to take it in. A nun, in full habit, began to sing and it sounded absolutely beautiful. The acoustics were amazing and while we couldn’t understand what she was singing, it sounded glorious in that enormous space. 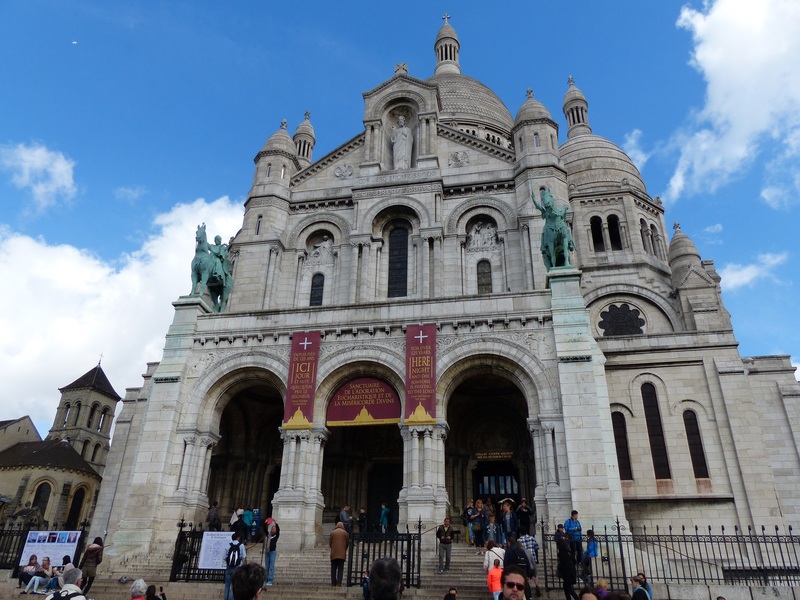 As we left the Basilica, we walked back through the streets of Montmatre and came upon some of the tourist areas, which were crowded with lots of souvenir shops around, which wasn’t quite as charming as the areas we had walked through on our way up. Before too long though, we had left that section behind us and were back among the quiet streets with cobblestones and beautiful buildings. I just love being in those places. I loved it in Portugal too, those lovely little back streets and cobbled lanes that are untouched and “real”, so I really enjoyed our walk through Montmatre. 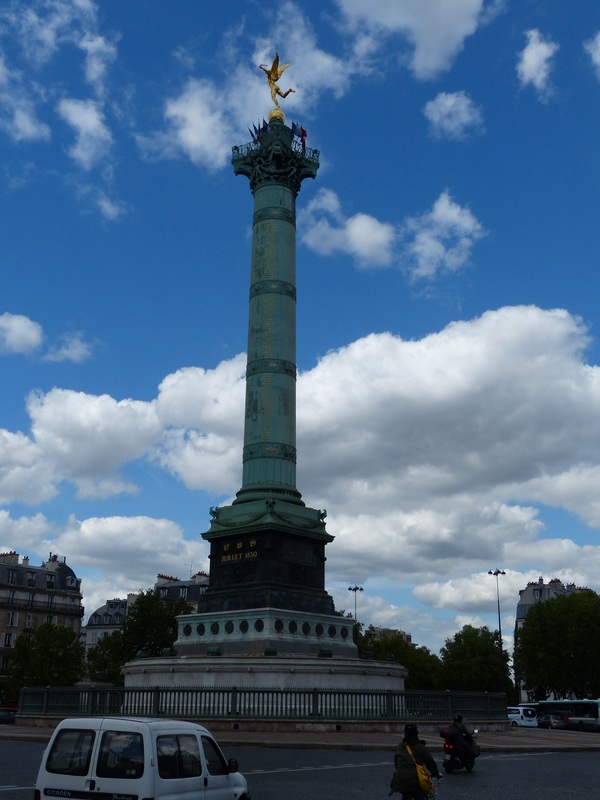 We headed to the Metro again, to take us to the Bastille, where we intended seeing the area made famous by that conflict, remembered by Bastille Day and made famous by the musical Les Miserable. It was in the area of the Bastille that we had also decided to go out for lunch and I had found, thanks to my trusty Happy Cow App, a vegan cafe. We were lucky enough to get a table without a reservation, which was lucky because not long after we arrived they started turning people away because they were full. Note to chefs and cafe or restaurant owners…this always, ALWAYS happens in veggie cafes and restaurants, they are super popular, so let’s have a few more of them please, instead of seeing us vegos as an inconvenience!! We both ended up having the same thing for lunch and it was A-MAY-ZING!! Actually, it was amazing from the first moment I opened the menu, because I knew I could have anything, because it was all vegan and it all sounded delicious and that’s such a novelty for me! We had the Portobello Burger (they even had a gluten free option too!) that was jam packed with salad and vegan cheese, with a side salad and a side of roasted potato pieces, with a chimichurri dipping sauce. OH…MY…WORD..it was great! Then, since this was a real treat, we went for dessert too and had the Chocolate Bavarian with vegan cream and raspberry coulis. That was SEN-SAY-SHUN-AL!!! We both enjoyed every mouthful and both agreed that there should be more places like this, since veggies and non-veggies alike can enjoy amazing food like that. So that was the amazing “Food” part of the day and it was super-dooper brilliant! How good is that! Vegan deliciousness!! What a treat! The “Family” part of the day came as we were finishing lunch. Steve’s mum and dad arrived in Paris today. They’re over here with friends to do a cruise, before doing some independent travel of their own through Europe and the UK. So today we met up with them and it was lovely, just lovely to see them and to have that connection with home too. We caught up, went for a walk, had a cuppa in a cafe, before they left to get ready for their dinner at the Eiffel Tower. We’ll be spending the next couple of days with them and we leave our campsite tomorrow and move to Paris centre. Their gift to us last Christmas was two nights in a Paris hotel, so we’re heading there tomorrow and will have a couple of days at the hotel in the heart of things. Thanks Len and Pauline! Then we’ll do some roaming together before they head off to start their cruise and we set off back up north to catch our ferry to England. We finished the day with some walking around the shops, splashed out on another puffer jacket each, to add to our layers and to get another waterproof item, to help with all the wet we’ve been having! Then back on the Metro for the rush-hour, sardine experience as we made our way back out of Paris to Champigny and our little cabin at the campsite. What a great day! 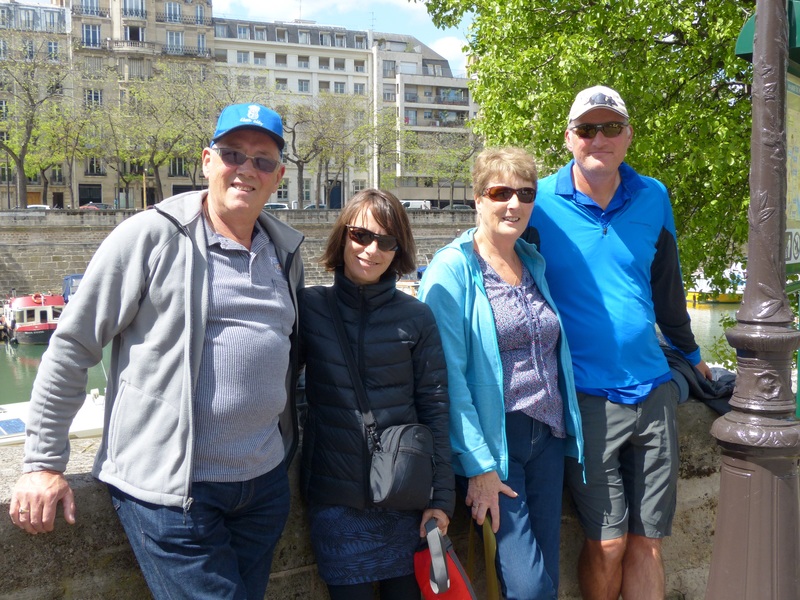 Some lovely walking through quaint and charming streets, seeing and visiting some more amazing places and buildings, having an absolutely delicious and decadent lunch and then topping it off with a family reunion. A top day! We’ll be back on the bikes again tomorrow for the ride into the city, hopefully along bike paths or at least bike lanes and hopefully without any cobblestoned roundabouts in the thick of traffic! I wonder if it will rain? I’m sure the sky will open just as we set off! It’s bound to! Why change the pattern that’s been with us for so long!? Whatever! We don’t care! We’re loving Paris! 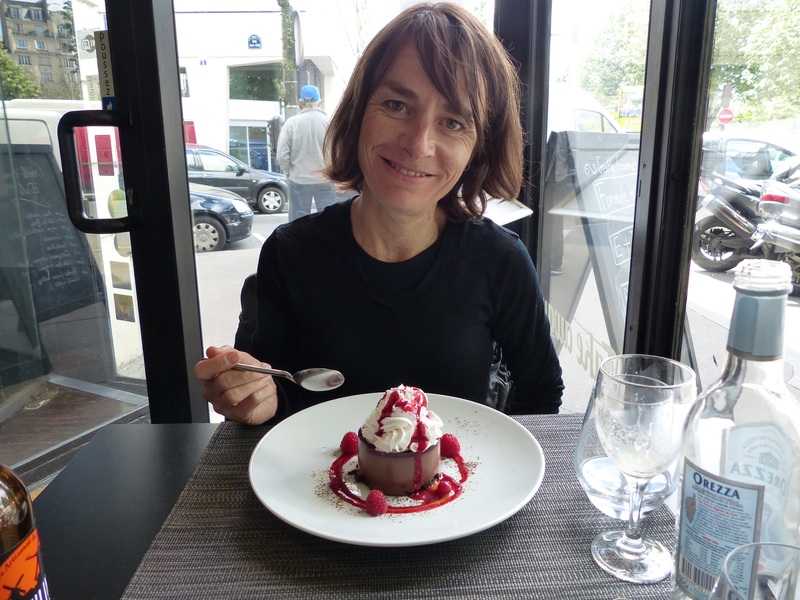 That dessert looks fab – we definitely need some of those places around here 🙂 Funny enough I found a vegan recipe the other day for chocolate mouse that I plan to try soonish!! It sure was fab with a capital “F”!! Let me know how the mousse turns out, I haven’t made any vegan desserts, so you can be my trailblazer! Did you have anything to eat at the artist’s square that was nearby Montmatre? I met Graeme and Beth there when l was in Paris. They both showed off by ordering what they wanted to eat in French. The waiter didn’t have a clue what they were asking for, which l found really funny, especially with Beth. I ordered in good old English and he understood me perfectly. Did you go inside the church? It’s beautiful in there. We went in at Mass time, so we could really have a good look around inside. No, didn’t eat anything at the artist’s square – eating out for me is just too hard anywhere other than a dedicated vegan place. I can’t even get a salad here that isn’t full of meat. So I save myself the stress and growing hunger while I try and discover something and just self-cater or eat at a vegan place. What a hoot for you, ordering with Graeme and Beth…chuckle! We went to the Basilica and we were there for Mass too, so we sat and listened to the nun singing. It was beautiful. I still laugh about that experience with Graeme and Beth. There’s both of them showing off like mad speaking French, and not being understood by the waiter. And then there’s me, who could only ask where the toilet was and if the person spoke English, being the one who was able to place an order and be guaranteed to get what she wanted. Jan is right. That desert looks DELICIOUS!!!! Hope it tasted as good as it looked.